Auckland's light-rail future starts here! With a busy period of construction coming up in Wynyard Quarter, the tram operation has had to be suspended. The tramway was operating a reduced service between the Tram Shed in Daldy Street and Tram Stop #1 at the northern end of Halsey Street. the northern end of Wynyard Quarter. Come and check out the changes in Wynyard Quarter ! The trams are operating presently just on Sundays and Public Holidays on just a section of track, until the full loop is back in mid-2019 when the final phase of road redevelopment is completed. 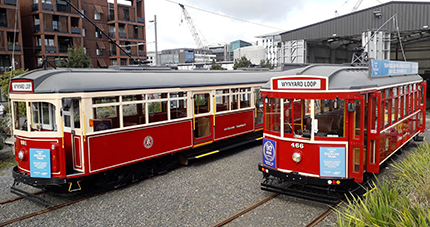 Our tram takes you on a 1.5 km circular tour around Wynyard Quarter with a commentary provided by the Tram Driver, pointing out items of interest, a bit of history, and some fun things for the kids to do while in Wynyard Quarter! The Tram Ticket purchased from the Tram driver is an "All Day" ticket so you can stay on the tram or hop-on or off at any of the four tram stops. Our Group Tours will recommence in 2019 once the trams are running over the full loop once again. Check our Groups & Charters for more details. Explore the exciting new Wynyard Quarter, revitalised to celebrate the Rugby World Cup 2011. Journey past parks, plazas, restaurants and cafes and the Auckland Viaduct Harbour. Take in an event, the Voyager Maritime Museum, markets and plenty of shopping. Stop by a jetty for fishing, fresh seafood, super yachts, maritime history and more. After 55 years, this romantic vintage form of transport has returned to Auckland city, offering a nostalgic travel experience journeying around the area and passing the site of the 1925 built Gaunt Street tram depot, now home to NZ Bus. These perfectly restored, original condition trams offer affordable style and family-friendly fun. Check out Silo Park centred around the old cement Silos, and home to Silo Cinema, open air movies every Friday night weather permitting. Discover the heart of Auckland’s waterfront with Auckland Dockline Tram. Click here to read more about the highlights you'll see with Auckland Dockline Tram. Find out about the history of trams in Auckland and the fleet that you'll get to ride on.